Material GRP The Savage Cabin range of boats has earned itself a formidable reputation the all new 585 Cabin will certainly rank highly on safety, performance, value for money, fishability and innovative design. 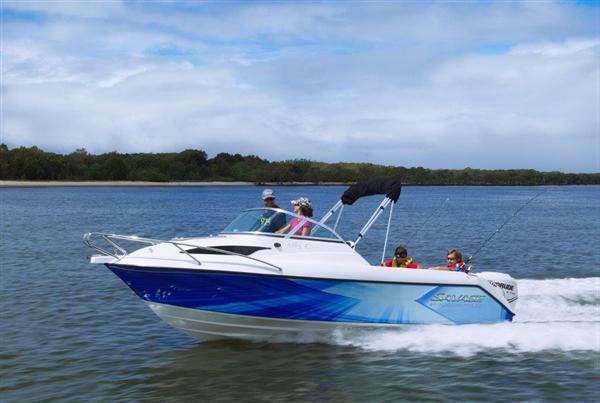 A perfect combination for family boating and fishing fun, the 585 Cabin offers you advanced fishing requirements with a few more of the little luxuries for the family weekend away. Savage’s 100% Composite construction hull also guarantees a smooth ride, with precision handling and superior strength without fear of timber imperfections. Perfect for offshore fishing or a family day on the water, the all new 585 Cabin will keep the whole family happy.